Queen of the Pacific (#20587) (1882-1935), 336-foot, iron-hulled, commercial passenger cargo steamer/brig built in Philadelphia for the Pacific Coast Steamship Company. Her name was shortened to Queen in 1890. She was in service from 1882 until 1935 when she was scrapped in Japan. 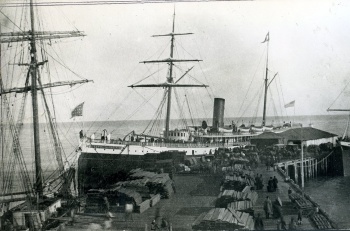 She had three decks and two masts, and could carry over 300 passengers. 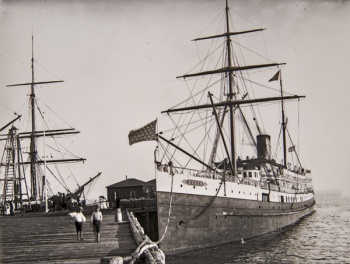 Queen sailed for both the Pacific Coast Steamship Company and later the H. F. Alexander’s Pacific Steamship Company, and for many years she operated as a shuttle between San Francisco and Seattle. Queen replaced the popular old wooden side-wheeler Orizaba built in 1854. Santa Cruz Island Company invoices indicate she ran supplies for the island from 1891 through 1914. She was in service from 1882 until 1935 when she was scrapped in Japan. 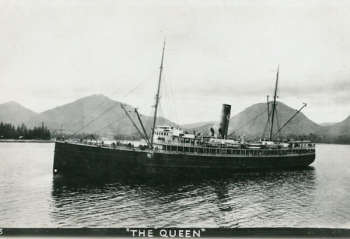 In 1907 it was reported Queen became the first wireless-equipped merchant vessel on the Pacific Coast. Her popular running mates at the time were the Santa Rosa and the State of California. This page was last edited on 9 May 2016, at 06:55.